It's been a long while since the Nonce were introduced to the world via 'Mix Tapes.' 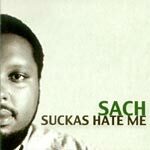 Now almost 7 years later, surviving member Sach drops his first official solo album on Japan's Mary Joy Recordings. 12 Tracks of that classic lo-fi production the nonce is known for, plus special guest appearances by friends Suga B, Medusa, and Zagu Brown among others. Produced by Sach except: 1, 6 by Adlib, 12 Omid. Live trumpet on 'Black Earth,' and live flute and kalimba on 'I Live On' by Sach. Cuts on 'Miracle' by J-Sumbi.